In a landmark judgement on October 25, 2017, the National Green Tribunal’s Eastern Zone bench ordered demolition of a 60-feet-tall illegal structure enacted by Vedic Dharma Sansthan Trust, a part of the Art of Living Foundation. The building named “Temple of Knowledge” was built illegally by filling up wetlands within the premises of East Kolkata Wetlands, according to the Ramsar Convention on wetlands. The onus of demolition was put on East Kolkata Wetland Management Authority (EKWMA), the guardian body under West Bengal’s environment department, looking after the protection and management of the wetlands. Despite EKWMA’s repeated notifications to the trust since 2015 on the illicit nature of their work, the construction continued unabated. Environmental non-profit People United for Better Living in Calcutta (PUBLIC) filed a petition in the NGT in 2016. “Even an FIR was lodged against the trust that is part of Sri Sri Ravi Shankar’s network but to no avail. Perhaps godmen think they are above the law,” says Suvrajyoti Chatterjee, member, PUBLIC. The non-profit was instrumental in its declaration as a Ramsar Site in 2002 and obtained the first order to protect the East Kolkata wetlands from the Calcutta High Court in 1992. On the October 25, the green court ordered to raze the construction, setting a precedent for EKWMA to carry out the functions vested in it by law—demolishing illegal structures and restoring wetlands. Violation of other laws meant to protect wetlands also came to light. “Apart from the 3 storied illegal structure, a road was built around Munshir Bheri in Sector V by Nabadiganta Development Authority. Neither had obtained the requisite permission,” says advocate-activist Meghna Banerjee from PUBLIC. 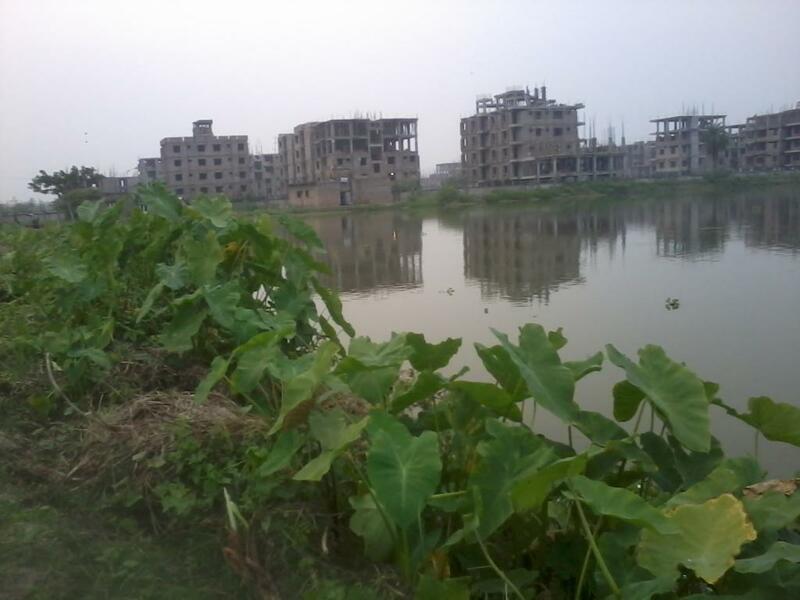 While PUBLIC’s original application asked for removal of unlawful constructions and restoration of wetlands to their original status, Justice Wangdi further suggested that the East Kolkata Wetland Act allows for filing criminal charges and therefore directed filing a compliance report with the tribunal. “In case of non-compliance, we may again approach the court. Now that our petition has drawn the NGT’s attention to EKWMA’s enforcement role, we hope that both surveillance and enforcement should improve and encroachments will reduce, states Banani Kakkar of PUBLIC. When contacted, a member of the East Kolkata Wetland Management Authority, who does not wish to be named, informed that a letter was sent to Vedic Dharma Sangsthan Trust to demolish the building within 30 days from the court order. It has been almost a month since, but the trust has not responded. No action has been taken against the road, but the official maintains that the EKWMA is committed to restore the marshes as promised in the court. Firstly, Is the blogger/columnist sure that a notice has been served? I happened to have chanced upon this information on a particular portal while surfing the web and reverted to VDS trust for clarification much to their surprise since there was no notice received pertaining to this (as on the date I brought to their notice). In which case it surely doesn't constitute a legal notice and definitely not obliged to be taken cognizance of. (VDS Trust may or may not have received the notice subsequently). In any case, I have been given to understand that all records are available to prove and get this erroneous order declared legally untenable and void. Secondly, why target one 60' tall structure that too one built to a sanctioned plan, even before EKWMA came into operations? There are thousands of bigger buildings of commercial nature that has sprung up post operationalization of EKWMA in existence around this "Not-For-Profit" Temple of Knowledge structure.. Therefore singling out ToK indicates something seriously amiss. Lastly, it may be pertinent to note that the plot of the Trust has been categorised under the schedule to the East Kolkata Wetlands (Conservation and Preservation) Act 2006, as one in which Rural and Urban Settlement was allowed. The structure of the Trust was therefore perfectly legal and valid.